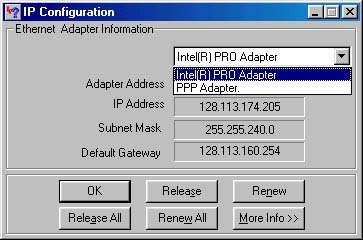 This procedure is used to Release and Renew your IP address. It is useful for when you move your laptop from one room to another without rebooting, and when you switch from a wireless to a wired network connection. 3. A command prompt will now open up on your screen. 4. 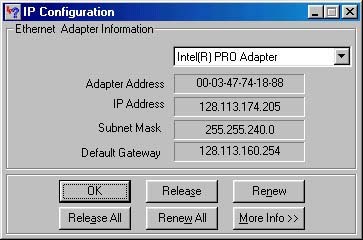 Type "ipconfig /release" then Type "ipconfig /renew"
5. If there are errors during the Renew and you do not get an IP address, check your network cable and try rebooting the computer. If problems continue, contact the Help Desk by calling x7777 or via e-mail. 1. Click Start, then click Run. 2. Type "winipcfg" and press Enter. 3. If your ethernet card is not already selected, you may need to select it by clicking the Down-Arrow, as shown below. 5. If there are errors during the renew and you do not get an IP Address check your network cable and try rebooting the computer. If problems please submit a request for assistance.